“I don’t think we could’ve have packed anything more into this event,” says SCMM President Michael Garcia, referring to the Death Valley/Las Vegas Run that the MINI Maniacs held March 21-24. Forty-eight members took part in the four-day adventure in the desert. It all began with a meet-up at the Krispy Kreme in Ontario Mills, where members received a goodie bag filled with candy and snacks, Adams Detail Spray, a microfiber towel, and the latest Hot Wheels “MINI Cooper S Challenge” car. During this first leg of the trip, the MINI Maniacs encountered torrential rain on the Cajon Pass, but once over the summit it cleared to beautiful clouds and sun. The first pitstop was at the Mad Greek Cafe in Baker. It was there the group learned of a road closure in Badwater Basin. The rain storm the previous night had flooded the road through Badwater in Death Valley. With the aid of an analog GPS (also known as a roadmap), the route was altered to avoid the closure. Badwater would have to wait. 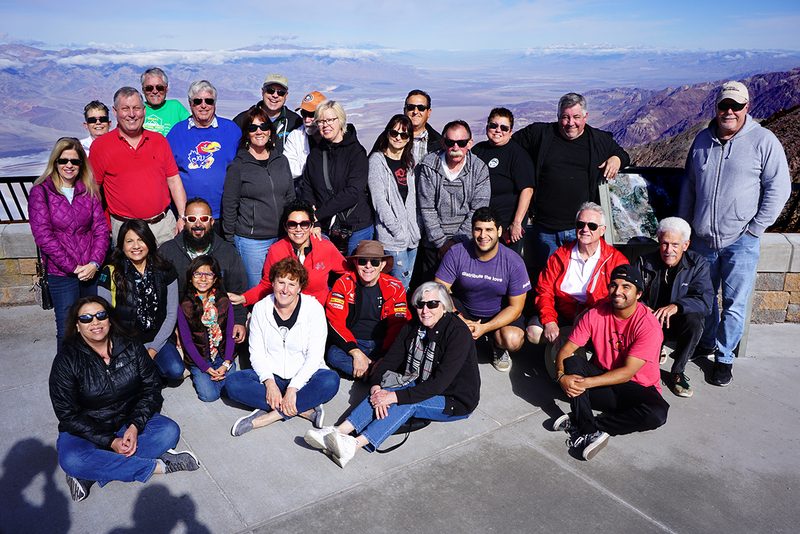 Upon entering Death Valley, the group made a visit to the Oasis Resort, formerly the Inn at Furnace Creek, for some liquid refreshment and to check out the historic upscale hotel. From there, it was time to head over to the “slightly less-upscale” Stovepipe Wells motel for the night. On the way, some members stopped at the Devil’s Corn Field and the Mesquite Flat Sand Dunes for some photos. 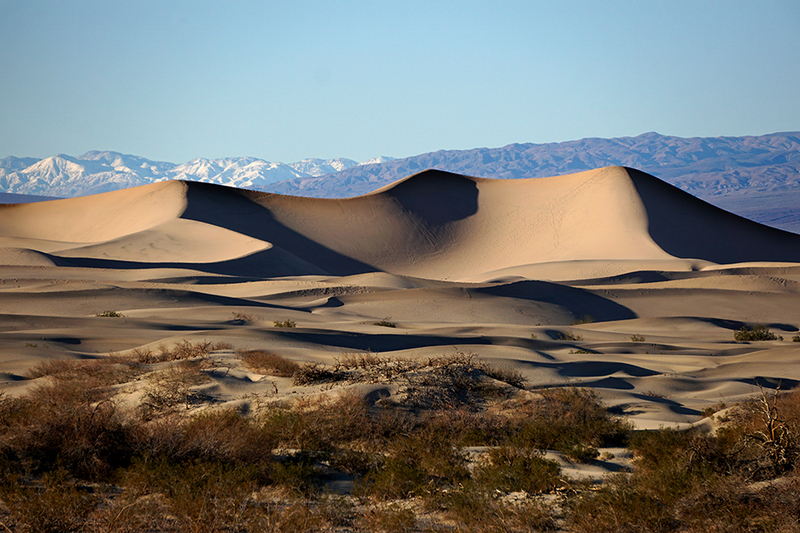 The Mesquite Flat Sand Dunes are popular with photographers and hikers. 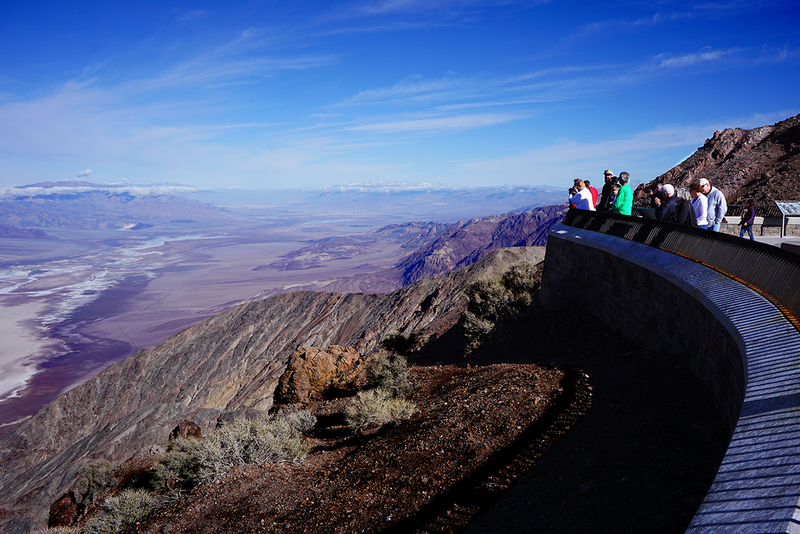 On day-two in Death Valley, members woke to clear skies and a busy itinerary, beginning with a run up to Dante’s View, where the enormity of Death Valley is fully appreciated with a panoramic vista that is nothing short of breathtaking. The largest national park outside of Alaska, Death Valley encompasses 5,262 square miles, nearly 3.4 million acres. Dante’s View provided an opportunity for this group photo. After a group photo at Dante’s View, the MINIs set off for yet another breathtaking view, inside the Amargosa Opera House, located at Death Valley Junction. Formerly a railroad stop for the local Borax mining operations until 1940, the buildings including a hotel and social hall, were left abandoned and decaying. That would have been the end of story had it not been for a flat tire on Marta Becker’s car in 1967. A classically trained dancer from New York, Becker saw potential in the old social hall, and eventually purchased the entire town. She turned the social hall into an opera house, painted murals on the walls, and made her first performance in 1968. Becker remained on the property, performing her one-woman shows, until her death in 2017. 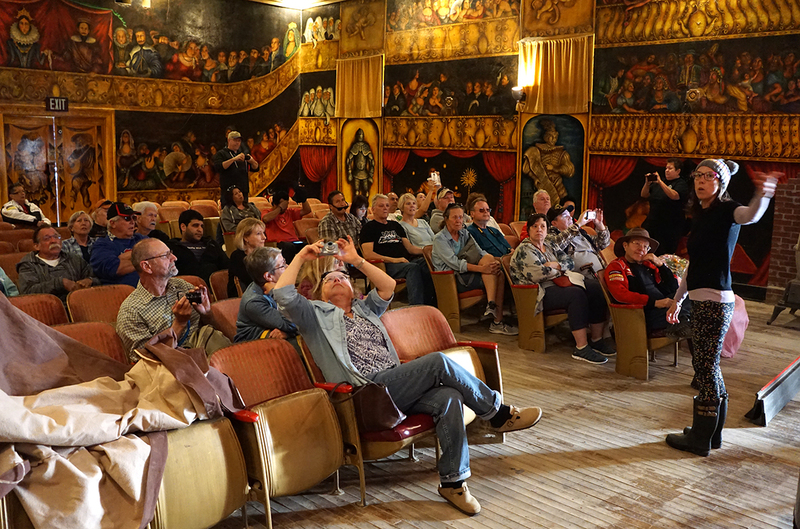 A tour of the Amargosa Opera House provided a glimpse into the life of owner Marta Becker. The MINI Maniacs’ next stop was lunch at the Pahrump Valley Winery, before continuing on to Las Vegas for two nights at the Silverton hotel and casino. The meal included wine, salad or lobster bisque, choice of sandwich, and cheesecake dessert. After lunch, some of the MINIs, led by Ted Lighthizer, made a run up to the top of snowy Mount Charleston. Saturday’s agenda was a free-for-all of activities that had members touring the Hoover Dam, exploring deep into the Techatticup Mine, riding the High Roller observation wheel, nibbling gourmet chocolates at the Ethel M factory, bike riding in Red Rock Canyon, playing Bingo at South Point Casino, taking in a Vegas show, and partying the night away at Hofbrauhaus.